For Terrence and Shirley Pruden, St. Kateri Tekakwitha is a reflection of their lives. In appearance. In lifestyle. And in faith. The 17th century saint looks like the Prudens, who were born and raised on the Goodfish Lake First Nation, about an hour’s drive northwest of St. Paul, Alta. The Prudens, who enjoy gardening, relate to St. Kateri’s upbringing and communion with nature. 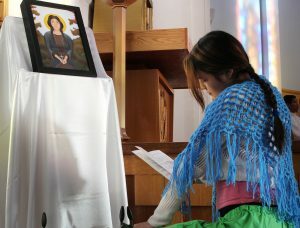 St. Kateri has also become a big part of the Prudens’ faith journey at their home parish, St. Paul Cathedral, which hosts a unique ceremony that reflects the saint’s life. The Prudens also rely on St. Kateri personally. They ask for her intercession, and they have received it. They say they’ve found the strength to survive harrowing experiences including a shooting, the loss of a child, cancer, and other health issues. “I can turn to her and ask her for intercession. I do that,” Shirley added. “Kateri is not only a saint, but she is a very great saint. 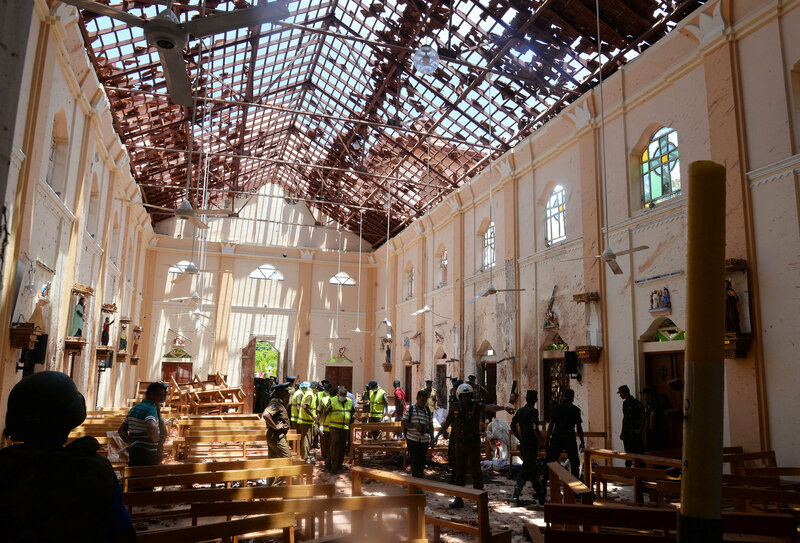 She is not just any virtuous woman,” said Bishop Paul Terrio. St. Kateri — known as the “Lily of the Mohawks” — was born in 1656 in upstate New York to a Catholic Algonquin mother and a Mohawk chief. After her Baptism, she lived a faith-filled life until her death from tuberculosis in 1680. 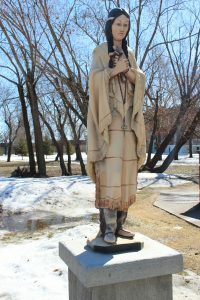 Miracles and answered prayers have been attributed to St. Kateri. 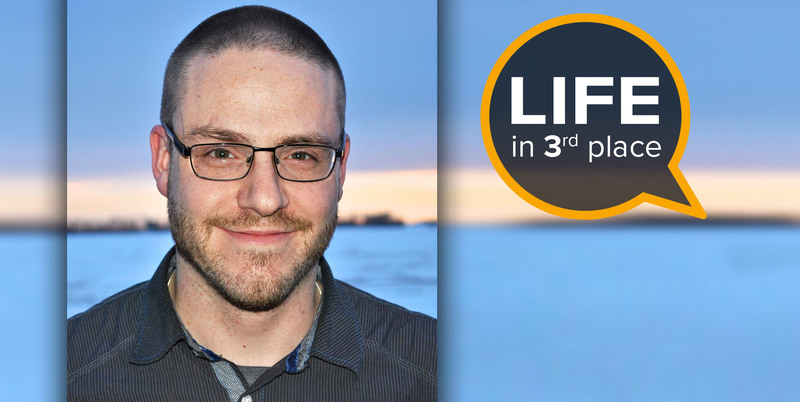 Terrio began his ministry in the St. Paul Diocese shortly after St. Kateri’s canonization in 2012. Since then, the Diocese has honoured her each year. 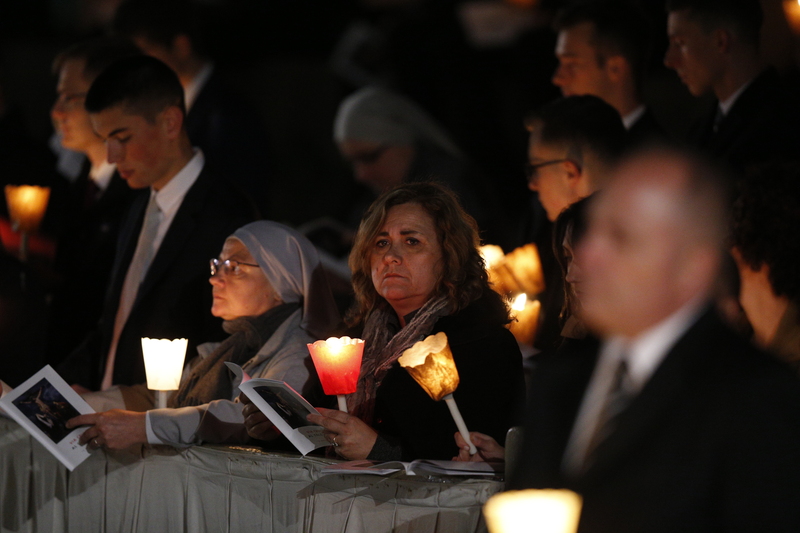 Nearly a hundred people packed St. Paul Cathedral on April 20 to celebrate the life of St. Kateri, a secondary patron of the diocese, in a unique annual ceremony. It’s an event that the Prudens as a family help organize — from the handmade wooden crosses, to an oral history of St. Kateri’s life. 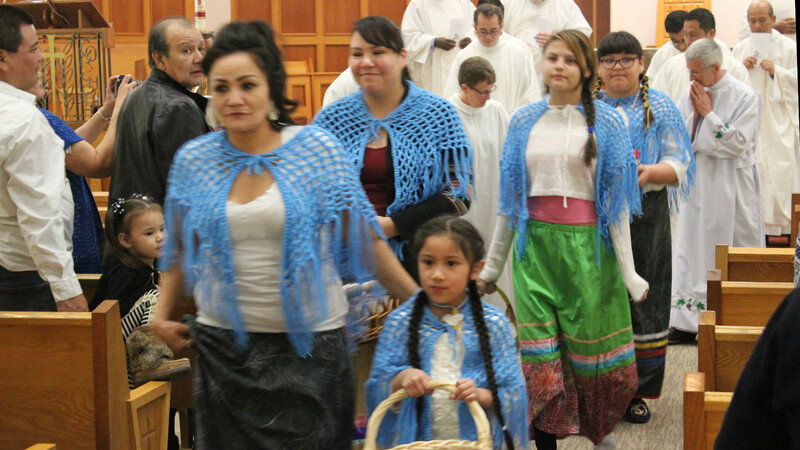 Seven girls and young women, dressed identically in a shawl and dress as St. Kateri might have worn, recite sections of a narrative of her life until her death at age 23. Among them are two of the Prudens’ own grandchildren, seven-year-old Jasmine and 14-year-old Blossom. 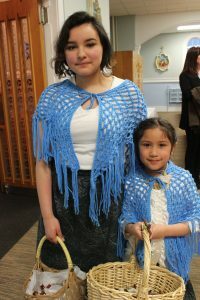 “It means a lot to me to be a part of this, because it’s our first native saint and she helped a lot of people and it’s our culture, our people,” said Blossom, who is in Grade 8 at the junior high school opposite St. Paul’s Cathedral. 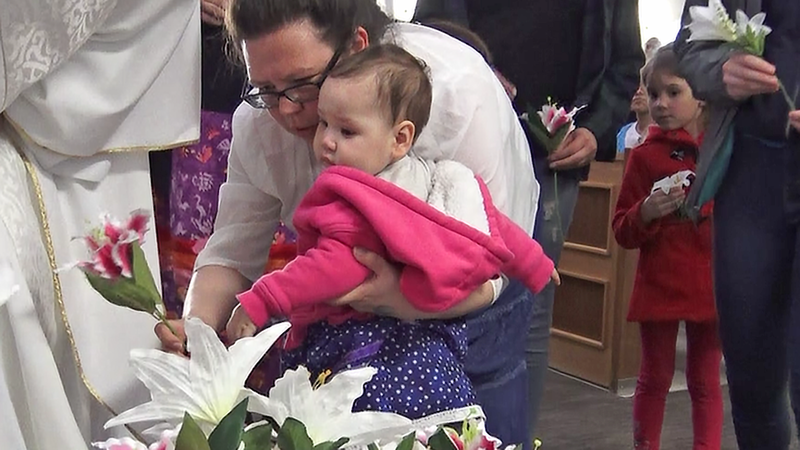 During the St. Kateri ceremony, each of the young women places a lily in front of the image of St. Kateri, painted by the Prudens’ son Todd. 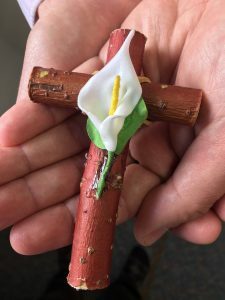 At the end of Mass, they distribute crosses that parishioners have handcrafted in a way that St. Kateri might have done. 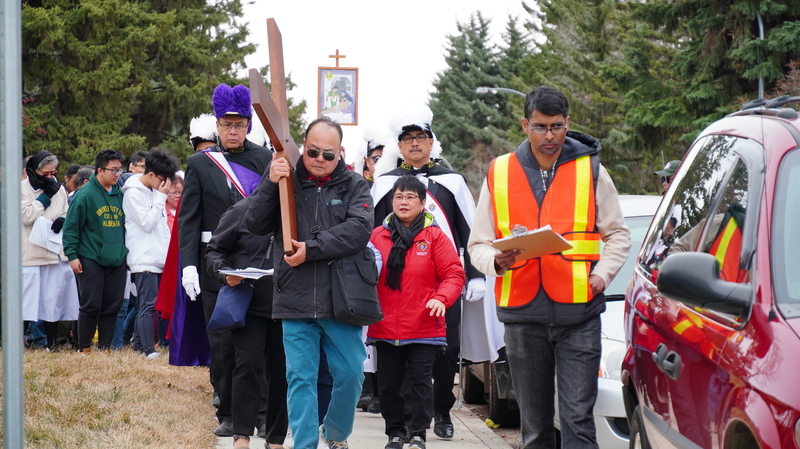 Crosses are made each year from Red Willow, which grows wild throughout the St. Paul diocese. Each cross is made of two branches of red willow, native to the area around St. Paul. The longer branch is four inches – representing the four Gospels – and the shorter is three inches, representing the Holy Trinity. 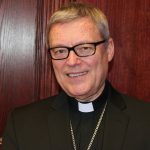 That connection surfaced again years later, in 1994, while Bishop Terrio was on mission in Brazil. 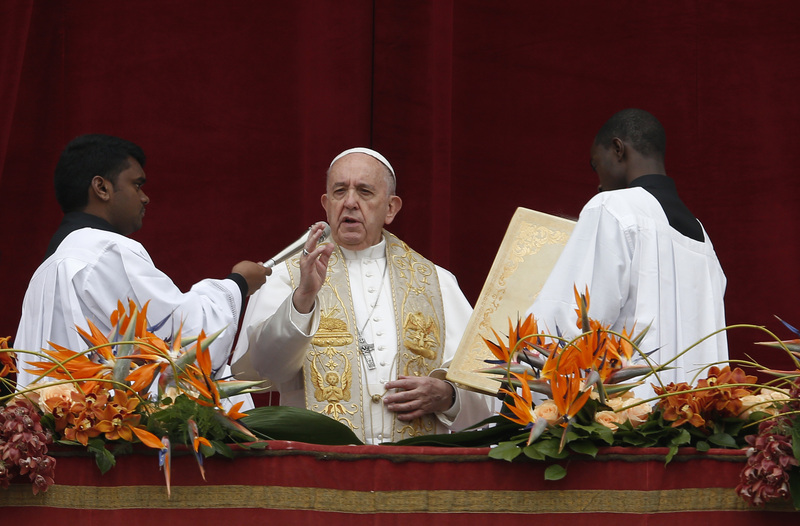 “I heard about her in Portuguese from one of my students in the seminary who was doing ministry with street kids on the weekends,” Bishop Terrio recalled. “He said ‘You know, she was orphaned very young and yet she didn’t lose her faith. Just like some of my street kids’. The St. Kateri ceremony is a powerful reflection of Terrence and Shirley Pruden’s Catholic faith that began at Goodfish Lake and in the pews at St. Mathias Parish where they were baptized and married. It’s also a reminder of a powerful plea that the Prudens vividly recall after four decades. 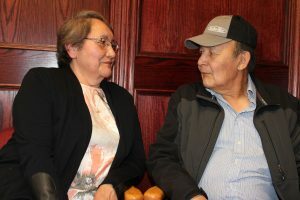 Terrence and Shirley visited his grandparents, sharing tea and bannock on a Saturday in January 1975. Just before they left, his grandmother asked them to promise to be at Mass and on time. The Prudens’ wish is that more First Nations people would feel that need. “A lot of the aboriginal people have turned about the churches because of residential schools,” said Shirley, who attended Blue Quills residential school for Grades 7 and 8 and had a “good” experience. Terrence said many First Nations people have been raised Catholic, but after the residential schools experience, they have fallen away from the Church. “The second generation was brought up basically without any form of religion. If they don’t have the faith, how can they pass on something they don’t have?” Terrence said. Shirley Pruden said it has been their faith — and in the later years the intercession of St. Kateri specifically — that helped them survive harrowing experiences during their nearly 50-year marriage. Shirley hopes more young people will learn about St. Kateri, and First Nations history, in schools.